Most freelancers and small businesses have had this problem at some point: a growing list of invoices which are overdue, and despite constant chasing up of clients, it never seems to end. It can take up time which most of us simply don’t have. Of course it also can have a huge effect on your finances, building up credit card debt or not being able to pay your own bills because of your cash flow problems. After dedicating some time to try some different methods and focus on this, I finally found the perfect system which transformed everything. In 21 days I got $38,283.10 of overdue invoices paid. Let me clarify that these weren’t new invoices - they were old, unpaid, overdue ones that had been lingering and growing for months. All of a sudden these seemingly impossible invoices were paid, with less time and effort. I ended up developing a simple and easy system which you can implement and start seeing results straight away as well. Here is a brief summary of how it all went down. In total I spent about two hours on this across the three weeks - that’s just 40 minutes per week! Since then, I spend even less because I have the overdue invoices under control and so only need to maintain the routine. This was the total received in the bank in the first week. It was a case of calling a client who paid the very next day. If I had known this would have achieved payment so quickly I would have called much earlier! This was also a bit of luck - most of the clients I spoke to weren’t able to make payments so quickly. Within the first week I had also confirmed many other invoices for payment, but they hadn’t actually been paid yet. I had to wait a few weeks for the payment to be processed - this is common with large companies, who usually have extensive compliance and approval processes to go through for each payment. This is something that is so easy to forget when you are chasing invoices: often when you resolve an open issue, it could be another 7, 14 or even 30 days or more before the payment actually hits your bank account. Another successful week of collecting overdue payments. I continued to receive confirmation of other payments but once again was still waiting for them to go through the necessary processes. The payment I received this week was actually an easy one - I simply needed to contact the accounts department directly, and they paid it two days later! This is when the work from the first two weeks quite literally paid off. The open invoices that were overdue for so long and addressed and resolved were finally paid. It’s important to recognise that the payments received this week were actually the results from my work in week 1 & 2. Because clients can’t pay immediately, there is a bit of delayed gratification between when you resolve the issues that are holding up payment and when you actually receive it in the bank. This is why it is so important to keep track of all of your open payments so that you can see your progress (even if you can’t see it in your bank quite yet). So how did I do it? I’m going to be sharing some tips for you to get started and also the information on how to learn the entire system below. You need to have a list of all of your invoices which are open for payment in one place - this helps you keep track of what really is open for payment, and save time looking for information on what is overdue. When you are keeping track of this in your head, it takes up unnecessary brain space and time. I created an easy to follow report template for this, more on this later. It’s easy to get bogged down with chasing invoices when you do it all the time, but when you do this your approach becomes scattered and inefficient. The best thing you can actually do is set aside regular time to dedicate to following up your invoices and not getting distracted by anything else. Make yourself a cup of tea, put on a playlist that you like, and focus only on your outstanding invoices list for twenty minutes or so. Remember, the more you focus, the sooner it will be taken care of and sooner you can move onto the next item on your to do list. A big hurdle most people experience with corporate clients is that the person who they are chasing is not the person who is in control of whether the invoice is paid. A symptom of this problem is continually speaking to your client but never really getting a clear answer on when you will be paid. Once you have contact details of the accounts department you are able to contact them directly and get answers on when you’re going to be paid or what might be holding it up. You want to figure out what your current time spent is actually costing you. I made the below calculator to help you get a better idea of how much your accounts receivable is currently costing you. Are you OK with spending that much on chasing your invoices? I wasn’t! So what I developed was an ultra simplified process that ensures that you can reduce your existing unpaid invoices and avoid any future invoices from ever being paid late at all. 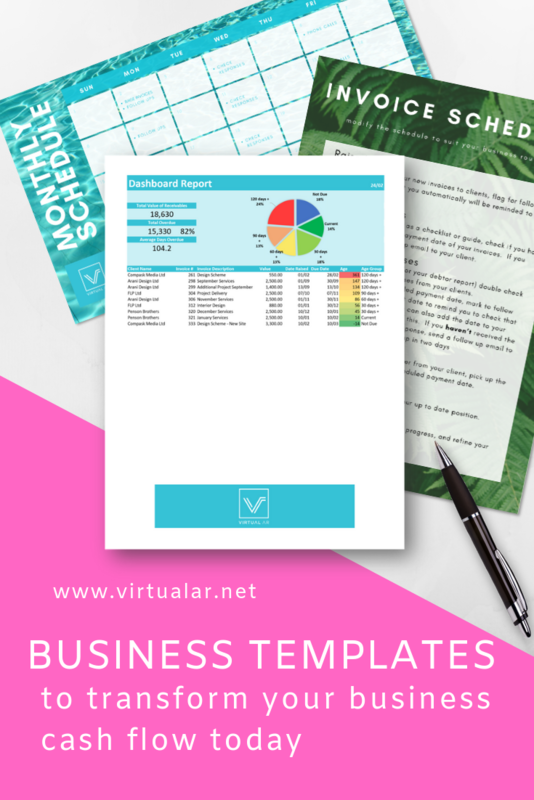 It’s all summarised in one simple course, providing the easy to use excel template for tracking your invoices, along with checklists and scripts for you to start using straight away. Are you ready to transform your business and forget about cash flow worries? Click here for more information, and get in touch for the promo code!